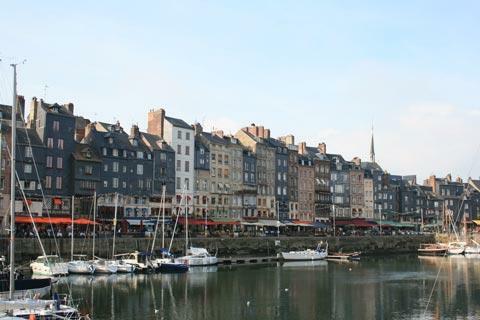 The Normandy coast has several interesting towns to visit during your stay in the area, among which a trip to Honfleur should be among your priorities. 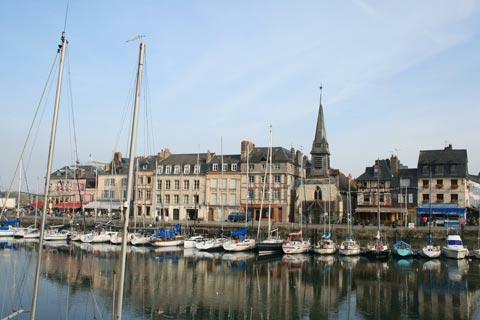 This coastal town is located on the Seine estuary just south of Le Havre, and is now easily accessible by the new bridge the 'Pont de Normandie'. This elegant bridge briefly held the record as the world’s longest cable-stayed bridge. 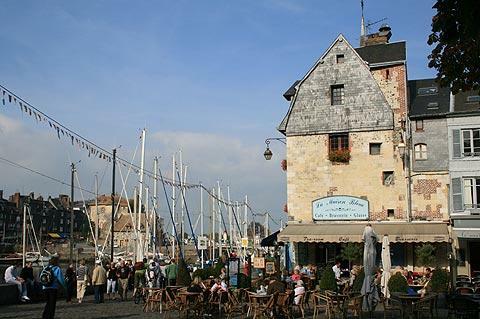 The pretty port and houses around Le Vieux Bassin (the harbour area) are the main attraction in Honfleur now, as they were 120 years ago when visitors started arriving at Honfleur. 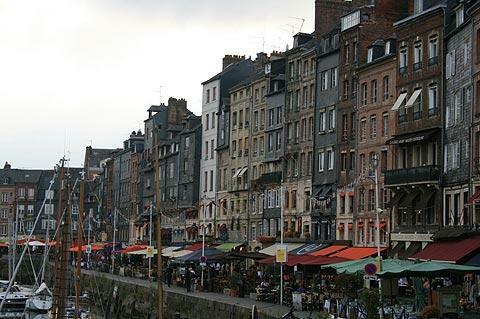 This port was built in the 17th century and apart from the narrow entrance for boats is surrounded on all sides by beautiful, tall, narrow buildings. Don't forget, you can also pick up your fresh fish in the market here! 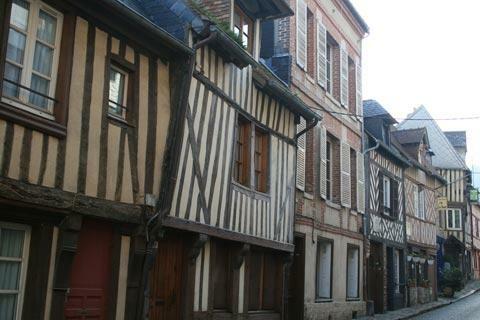 You will notice that many of the ancient houses have facades clad in tiles, a traditional technique in Normandy and Brittany. Between the houses and the harbour there are numerous cafes, and this is a very lively place for a promenade in the summer. 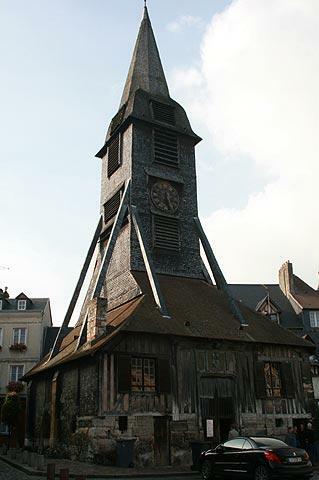 On one side of the port is the unusual wooden spire of the 15th century church of Saint Etienne. 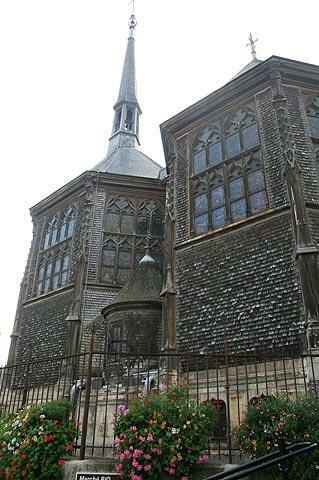 This is the oldest church in Honfleur and is now home to the town’s maritime museum, the Musée de la Marine. 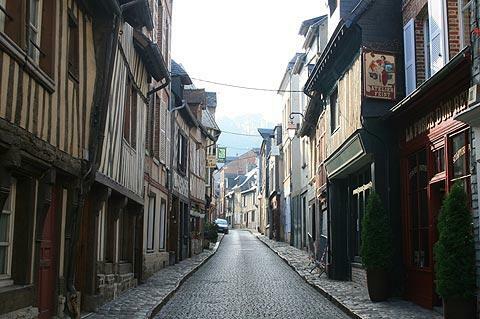 Wander behind the church and you will see the towns famous salt storage buildings, the ‘Greniers à sel’. These 17th century buildings were used to store salt which was in turn used to preserve the cod caught by the town’s fishing fleet. 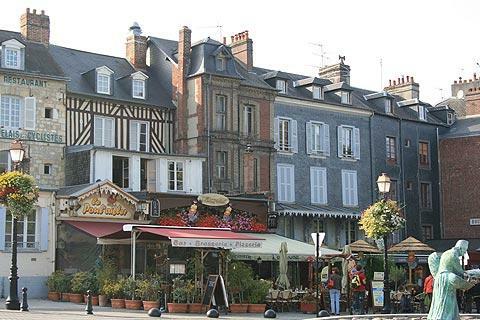 These buildings are now used for exhibitions and concerts in Honfleur and you can go inside and admire the wonderful wooden roofs. 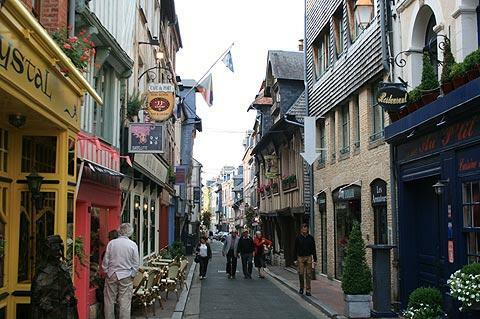 Although it is the tall houses around the harbour that have made Honfleur famous, the streets here in Honfleur old town also contain lots of interesting medieval houses, many now converted into shops and cafes. On the other side of the port is the wonderful Church of Saint Catherine. 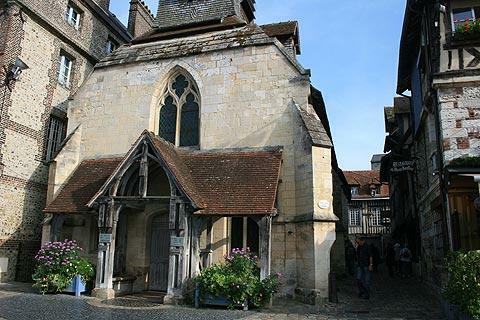 It was built of wood due to a shortage of stone at the time the church was built at the end of the Hundred Years War. With the large numbers of ship builders in the area wood became the obvious choice of building material. 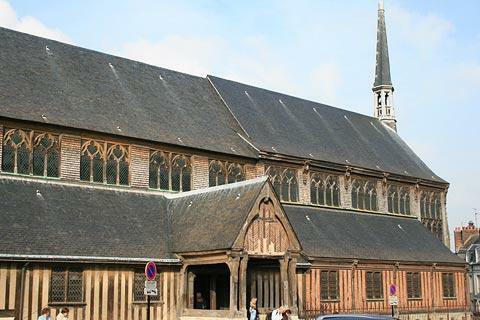 Saint Catherine’s church is the largest wooden church in France and it is lovely. 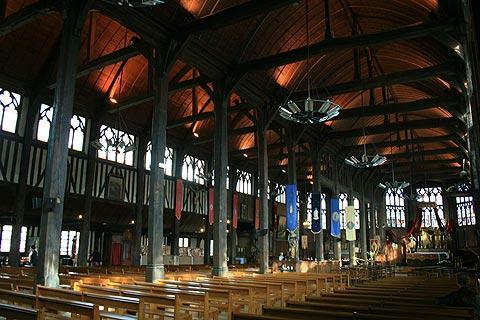 Take a look inside, it has a much warmer feel to it than churches made of stone and in the form of an upturned boat, with windows on all sides that allows lots of light into the church. The church of Saint-Catherine is slightly separate from its belltower The bells for the church were so heavy that a separate bell-tower had to be built and this lovely and unusual tower has inspired many artists to paint it, including Monet and Boudin. Eugene Boudin was born in Honfleur and he gave 53 of his paintings to the town. These are exhibited in the Museum Eugene Boudin, located in a chapel. 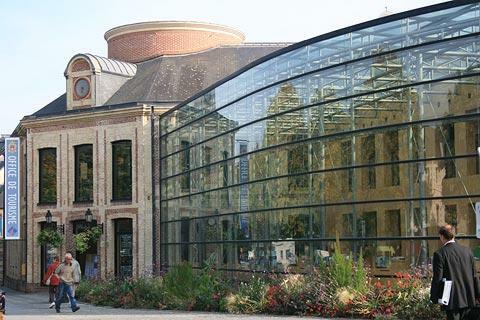 Works by Monet and other impressionist paintings are also displayed here. 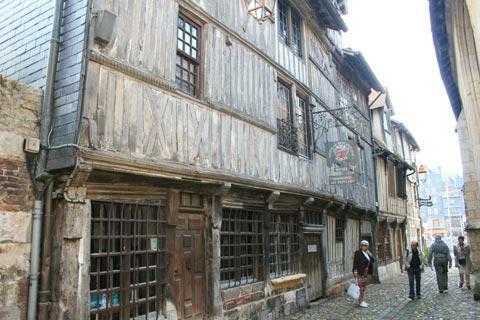 Another interesting museum in Honfleur is Les Maisons Satie. Satie was born in Honfleur in 1866 and worked with several of the great artists of the time, including Picasso, and inspired composers including Stravinsky and Ravel. The Maisons Satie are a musical and visual tribute to him. 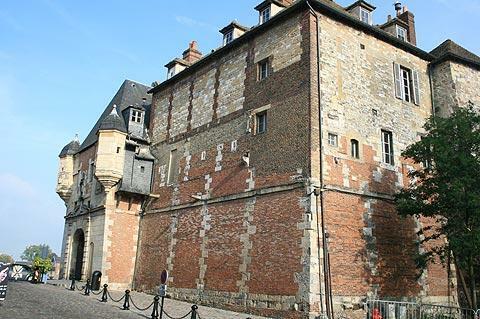 Housed in the old prison and 16th century houses there is also a Museum of life in Normandy, with traditional rooms and costumes at the Musee d’Ethnographie et d’Art Populaire. Further west along the coast from Honfleur the popular beach resorts at Trouville and Deauville are also highly recommended for a visit.